An Off-White Christmas features a dozen stories all set on or around Christmas, though with little to no clear religious emphasis. Instead, these stories explore life changes and choices and chaos in times of heightened drama, when family and friends and life partners merge to form cohesive units, happy or otherwise. 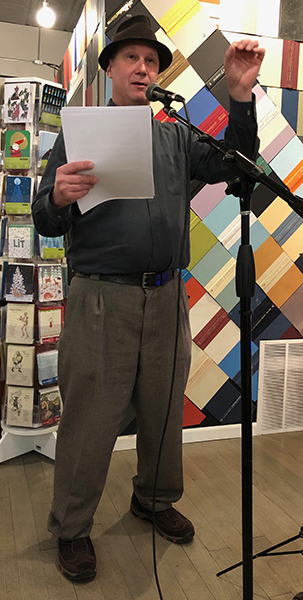 The stories range from a gambling spree in Las Vegas to a caravan traveling to Baraboo; from a teepee hotel in Kentucky to a retro movie theatre in Arizona; from a jolly Santa lookalike to a frustrated Dickensian actor; from students to retirees. 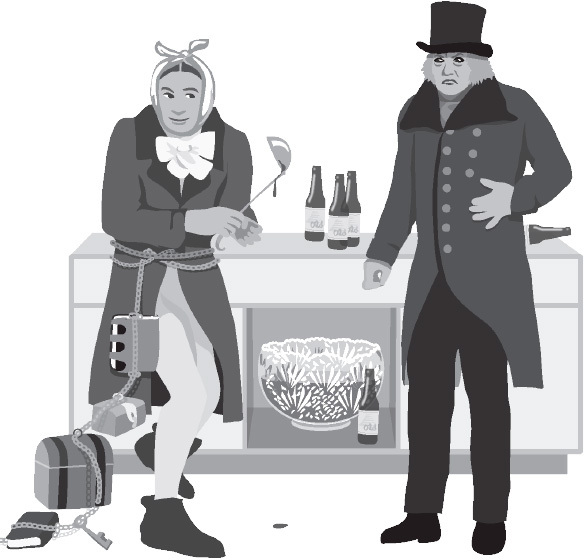 Christmas, in these stories, is a character as much as a setting—it acts upon and with plot to create tension, but each story is unique. It’s hardly all sugar plums and pure white flakes, but always there’s that hope. 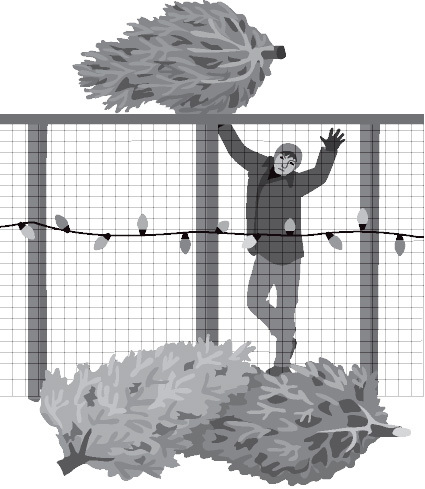 Just as the notion of a “white Christmas” evokes well worn traditions of the holiday, these “un-white Christmas” stories introduce potential traditions that could expand and augment the Christmas spirit. Hannah Jennings has designed and illustrated countless books, websites, and signs that interpret exhibits in zoos and museums. The focus of her MFA from the School of the Art Institute of Chicago was her artist’s books; she now teaches design at Dominican University. She is past president of the Society for Experiential Graphic Design. Her love of design, making images, and Christmas is apparent in her non-traditional online advent calendars; see them with her other illustrations at HannahJennings.com. The 198-page special collector's limited hardcover book features 24 black and white illustrations by Hannah Jennings. A paperback edition is being released simultaneously. A portion of the proceeds of this book will benefit the Chicago Literary Hall of Fame. Lovingly illustrated by Chicago artist Hannah Jennings, Evan's 12 tales may not always be filled with cheer; but with light humor and tenderness, they do illuminate the human spirit. 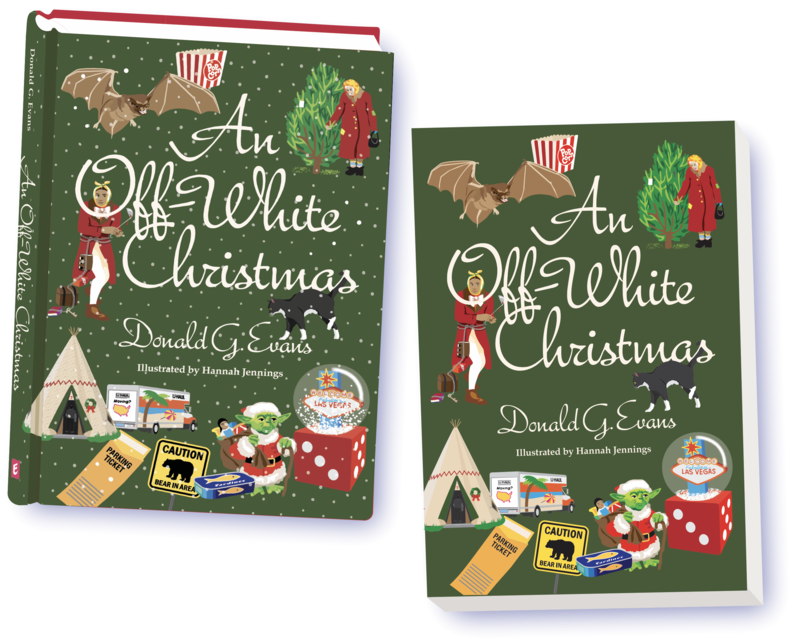 The stories in Don Evans's excellent collection, An Off-White Christmas, are full of witty, humane moments, vivid characters and settings that range from Chicago to Syracuse to Las Vegas. The people you'll meet here are your friends, your neighbors, your relatives—in all their flawed beauty and pathos. This book is not to be missed. Don Evans can get the streets to talk as if they're telling their own stories. One hears in his work an immediately recognizable offhand tone that rings true, empathetic, street smart, and very funny. 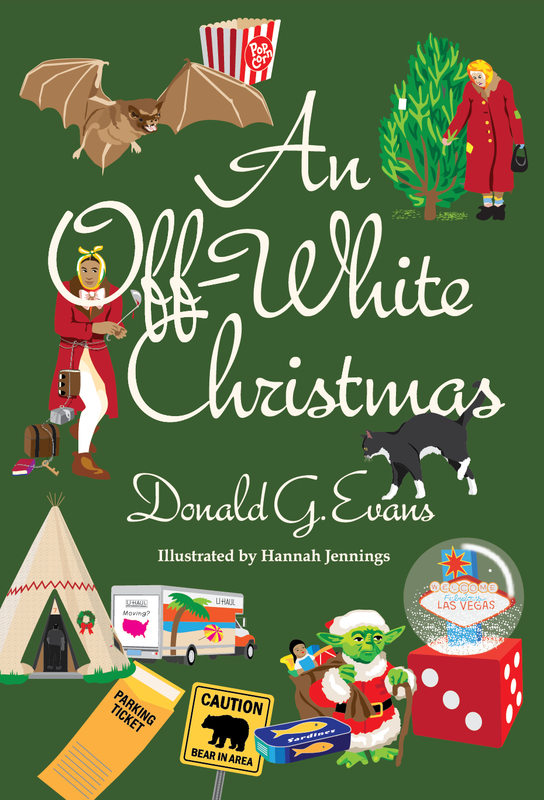 Donald Evans has a great ear and a light touch and together they lead An Off-White Christmas in unpredictable directions. Underlying what’s funny in these stories are real families, friends and lovers colliding or coming together in what promises, but doesn’t always turn out to be, the season of good cheer. A series of stories about families of all types as they each enter the holidays, the tales here range from the sentimental to the bleak, strongly reflecting Evans' natural love for our city's strong history of gritty social realism. 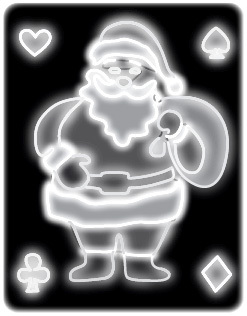 My personally favorite story of the collection, for example, “Tiny Flakes of Bone,” is an ur-example of this, as two former school chums celebrate Christmas with a sybaritic gambling binge in Las Vegas, their hazy 48 straight hours at the casino slowly revealing the fractures that initially drove the two apart, and how one has been able in middle-age to shed himself of his addictive demons, the other lost in a permanent wallowing in them. This Book Will Change Your Life… [T]hese stories are ostensibly about Christmas, and Evans build the stories around that framework, but holidays especially, are about emotions, all of them, and in all ways and combinations, and Evans knows this, and shows it. In every family there’s a rite of passage into adulthood: your first beer, moving to the adult table at holiday meals, the dropping of your nickname. In our family, you knew you were all grown up when Willie finally borrowed money off you. This old couple was about as old as old couples get. A write-up in the local newspaper said they had just celebrated their 75th wedding anniversary. Seventy-five years: I’d have to hit the streets running to even contend for that. Say I found a woman I loved, got her to love me back, and we eloped to a drive-through Vegas chapel—we’d still have to both make it into our low hundreds. Time’s a mystery in the casinos. There aren’t any clocks or windows, and pumped oxygen keeps you unnaturally energized. I felt juiced. It’s like, you’re minding your own business, and there’s a fire engine, and you don’t even realize you’re chasing the fire engine—you never decided, here I go after the fire engine—but before you know it you’re on the lawn watching the house burn down. The thing was, I didn’t know what I would say, what I would do. I so wanted to be married. I dreaded the prospect of hunting down another potential life partner. There was so much preliminary blah blah blah you couldn’t skip. Then if you guessed wrong, and so far I’d only guessed wrong, you were back at Square One. How was I ever going to get a baby blue Ford Explorer with She’s The Boss vanity plates from Square One? I woke before dawn and could not fall back asleep. I never remember a time when I believed in Santa Claus. Maybe nobody does. It’s impossible, I suppose, to reconstruct naiveté. I looked at my hardly started letter to Mom. I’d been telling her about the usual things here, and asking about the usual things there. I hunched over my pad. I fell back to recording little details—weather, food, rumors about travel and promotion and leave. Every time I tried to take up the subject of the little girl dying, I just couldn’t do it. 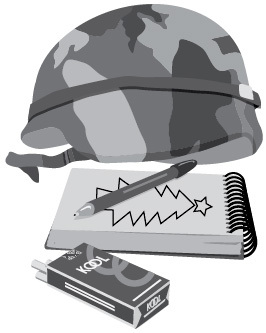 For the first time I understood why you rarely heard veterans speak of their war experiences. The thing you most wanted was to leave that there, and go back to whatever was left of normal. Wigley’s 9 a.m. energy level annoyed, no pained, me. It hurt just to stand there. Knowing Christmas Day would be sacrificed to this, I’d overdone Christmas Eve. It had started innocently enough but ended at a sticky kitchen table with sucked limes, spilled salt and a bottle of Jose Lopez. I thought, as Wigley went on and on about how knowing your lines did not mean knowing your character, that it only lasted one day. One dry Christmas, and I would wake tomorrow to a clean bill of health.